Spring has come, and JHS Pedals brings you the washed-out layers that only true amp style spring reverb can give you in the Spring Tank. This compact reverb pedal brings you an arsenal of settings to tweak, yet with utilitarian simplicity and usability. The Spring Tank gives you the ability to create the perfect spring reverb for your sound with controls for Depth, Length, Highs, Boost (to control your overall volume), and two independent and switchable reverb mixes called Tank 1 and Tank 2. The Depth controls the size of the room, while Length controls how long the reverb reverberates. Highs gives you the ability to control the tone of the reverb by adding or subtracting high frequencies. Tank 1 acts as your main reverb mix control, while Tank 2 is your secondary mix control engaged by the Tank 2 switch. So you have two reverb mix options on the fly! The designers also added a Boost control, so you can regain any perceived volume loss from the reverb.– Dial in the perfect reverb with Depth and Length controls. The Spring Tank has an effects loop, so you can put any effect on the reverb tails only. This gives you the ability to create amazing soundscapes with different effects. Just plug in a TRS splitter cable into the effects loop jack and insert any pedal into the loop and you're set. 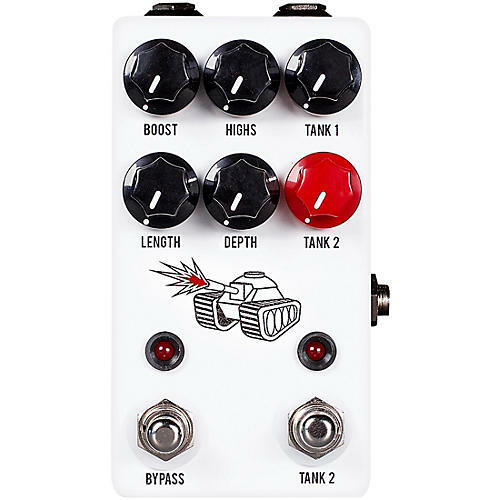 There is also an internal switch to choose to have the effects loop on only when Tank 2 is engaged or on all the time.With options a plenty and easy to use controls, blast your signal into the stratosphere with the Spring Tank!